Take away some of the aging of swiss cheese and emmental and you get younger, milder and higher-moisture baby swiss. Nobody knows for sure the origin story of this buttery delightful, full-of-micro-holes cheese. It seems to be native to the American Midwest and it seems to have been created sometime in the middle of the last century. In the hands of our Master Cheesemakers, baby swiss from Wisconsin is less bold than its siblings but every bit as versatile as swiss and emmental. You have our permission to make it all you own. This baby needs no coddling. 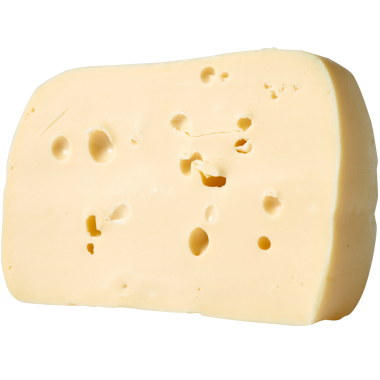 Baby swiss is best at room temperature, melts really well, and is a good and easy keeper. It’s hard to do baby swiss wrong, unless you try to pair it with something too sweet. We never hesitate to pull out the wine and beer for collaborations with baby swiss. Beers that pair well include stout, porter, weiss beer and lager. Wines that enjoy babysitting: oaked or unoaked chardonnay, grüner veltliner, champagne and cava. Baby swiss is a killer melter, and it makes a memorable omelette, frittata or quiche, whether cubed or grated. We also really enjoy it on a fully stacked club sandwich. We pile turkey, ham, baby swiss, sliced onion, lettuce and tomato on three types of lightly toasted bread (usually wheat, light rye and dark rye) and have at it.